"Peretz as great friend of children"
Browse Collections Collection-level Record Return to Digital Gallery "Peretz as great friend of children"
Title: "Peretz as great friend of children"
Description: "Peretz as great friend of children." Child's composition in honor of the 25th anniversary of the death of writer Isaac Leib Peretz, Vilna. 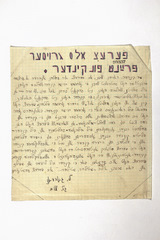 The composition praises Peretz's aid work on behalf of orphans and children in Warsaw during World War I.